It was already our second and hopefully not the last stay at Casa Rolando. 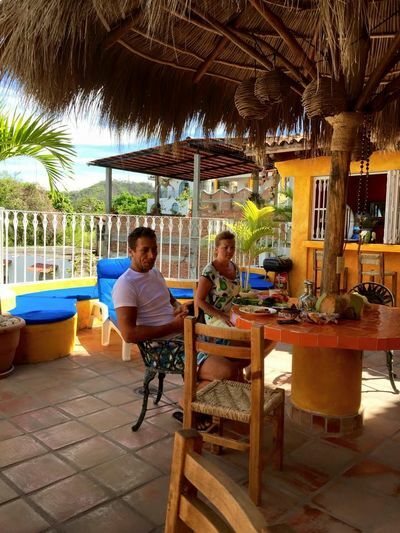 We had such a good memories on our first stay in this charming little hotel decorated in a beautiful and colorful Mexican style, that when we decided to visit Puerto Vallarta again, Casa Rolando was definitely our first and only choice. We booked the same room like the last time, but for our surprise, as a thank you for beeing a returning guests the general manager Jun upgraded us to the lovely Juan Maria room with a balcony and a spectacular ocean and city view. Staying in this room you can see the ocean from the bed and even while taking a shower, as there are small rustic windows in the bathroom, or you can just sit outside on the balcony and relax. As it was winter and there were not many guests during our stay, we could enjoy even more the tranquility and peace of this place. There is a big common terrace with great views, with a quite big and very clean swimming pool, with deck chairs and a big round table in the middle protected by a kind of palm leef roof, so you can sit there protected from the sun or even when it is raining. There is also a very well equiped kitchen which can be used by the guests all the time, we used to prepare our breakfast there. You can buy fresh fruits and vegetables is small shops just some blocks down the street and there are also many fish and see food shops, if you want to cook your dinner your self. In the kitchen there is drinking water for free all the time and all the areas are very clean and well maintained. During our stay it was raining for some days, so we also used the big and nicely decorated common area inside the hotel, where you can just sit around, read a book (there are different books and DVD for free use) or use your computer. The hotel is located is a quiet street in a residential area quite up a steep hill, but walking there keeps you fit (unless you have some serious health problems), just 5 minutes walking from the bars and restaurants of the Zona Romantica and 10 minutes away from the beach. The staff was very friendly and helpful and always available when we needed something. The only improvement suggestion would be to check the internet connection, because sometimes it was not working very well and if possible to bring back the iguanas which used to visit the pool before and we have not seen them this time, maybe due to winter. We had a great stay and felt very welcome at Casa Rolando and we hope to come back one day again. We highly recommend this place to everyone who is looking for more privacy, individual treatment and a local atmosphere in Puerto Vallarta, Casa Rolando is a great choice. I'm not one for all-inclusives or expensive chain hotels; rather I look for a more intimate place to stay with some charm and character. Casa Rolando is all of that. Mexican-American owner Rolando Donato converted his family's summer home into a beautiful 10-room guesthouse. The guest rooms are artfully and colourfully decorated with Mexican tile, artwork and furnishings. No two rooms are alike - the attention to detail creates an ambiance that is peaceful, relaxing and soulful. There is a small (cold!) pool that we Canadians enjoyed and several common areas (kitchen, poolside area, TV room) where guests can visit - it's a great place to meet people. Casa Rolando is centrally located in Zona Romantica, about three blocks uphill from Calle Basilio Badillo. Rolando is very helpful in providing suggestions for activities/dining out in the area. Rooms are very reasonably priced at US $75/night. Loved it! a charming and lovely place to stay..Rolando was very welcoming and generous with travellng tips..the view was stunning and the room was comfortable and adorable. I stayed there during my language school for some time and became friends with the owner Rolando quickly. The hotel has an amazing view over the bay and i made up in a mexican style, very colourful and nice looking. The owner is very friendly and will help you with all your doubts. I loved staying there for the atmosphere .The terrace with a small pool site is very comfortable also containing a community kitchen for all guests.Vallarta centro you reach within few minutes walking or by cab easily. The rooms are comfortable, and everything is very clean. I would definitely recommend this hotel as a good and cheaper alternative if you want to experience real mexican hospitality and not one of those boring stays in a chain hotel. SAS ! !